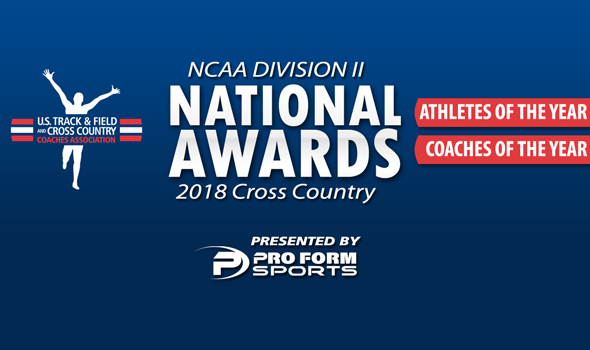 NEW ORLEANS – National Athletes and Coaches of the Year for the 2018 NCAA Division II Cross Country season were announced Tuesday by the U.S. Track & Field and Cross Country Coaches Association (USTFCCCA), following the running of the national championship meets this past weekend in Pittsburgh, Pennsylvania. Marcelo Laguera of CSU-Pueblo and Sarah Berger of Grand Valley State were named the Men’s and Women’s National Athletes of the Year, respectively, after their individual victories at a muddy Schenley Park. Jerry Batles of Grand Valley State swept the National Coach of the Year honors as his squads won both the men’s and women’s national titles. USTFCCCA National Awards are presented by Pro Form Sports. Marcelo Laguera wouldn’t be denied this past weekend. When Laguera and Zach Panning of Grand Valley State broke away from the pack a little more than halfway through the men’s championship race, it was clear that it was a two-man battle for the individual title. Both were running well and matched each other stride for stride. Panning attempted to put some distance between himself and Laguera with 800 meters to go, but Laguera caught up and sprinted past him for the title. Lagurea didn’t let off the gas pedal until he crossed the finish line seven seconds ahead of Panning in 31:46.4. This was a huge year for Laguera, who finished no worse than second in any race. Other notable finishes included runner-up efforts at both the RMAC Championships and the South Central Region Championships. Laguera is the first athlete from CSU-Pueblo to be named Men’s National Athlete of the Year during the cross country season. Sarah Berger got a change of scenery and a change of finishing order at the NCAA DII Cross Country Championships to boot. Berger, who finished runner-up last year as a senior at Walsh University, transferred to Grand Valley State as a graduate student and captured the individual title this past weekend. Berger was neck and neck with Elish Flanagan of Adams State until the homestretch, when she made her decisive move and won in 22:07.7. Once the postseason started, Berger really turned it up a notch. Berger won individual titles at both the GLIAC Championships and the Midwest Region Championships before capturing the biggest prize in the sport. Berger is the third female athlete from Grand Valley State to be named Women’s National Athlete of the Year during the cross country season, joining Kendra Foley from 2016 and 2014, as well as Mandi Zemba in 2005. Winning probably never tasted so sweet for Jerry Baltes. After years of finishing national runner-up to Adams State in the men’s championship race, Grand Valley State finally broke through in 2018. The Lakers won their first national title in program history this past weekend as they put four runners in the top-30 and won by 10 points over Colorado Mines. Grand Valley State ran well all season long as it also captured notable team titles at the Loyola Lakefront Invitational with 59 points, at the GLIAC Championships with 19 points and then at the Midwest Region Championships with 38 points. This is the first time in his illustrious career that Baltes has earned the Joe Vigil Award. Grand Valley State left no doubt this past weekend that it was the cream of the crop in women’s cross country at the NCAA DII level. The Lakers ran roughshod over the competition in adverse conditions as they totaled just 41 points, the fewest points scored by a team champion since Adams State put up 31 in 2004. Grand Valley State had five runners finish in the top-40, led by four in the top-10. In the postseason, the Lakers won the team title at the GLIAC Championships with 17 points and the team title at the Midwest Region Championships with 26 points. This is the sixth time in the past nine years that Batles has been honored with the Duane Vandenbusche Award.